Pre-loaded and disposable for ease of use. Two-openings for mice to readily enter. 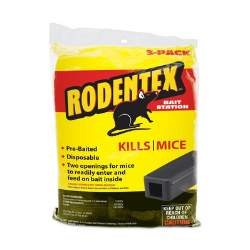 Kills rodents in just 6-8 days. Highly palatable, high oat content with low bait shyness. Mold and moisture resistant. Kills Norway rats, roof rats and house mice.